The FC Maribor (Slovenia) football player scores a victory goal during the street soccer tournament, in Milan, Italy. The Football for Friendship International Children's Forum, a social initiative organized by Russian gas giant Gazprom, gathered children from 32 countries around the world, including Syria, to take part in a street soccer tournament and watch the Champions League final in Milan. "When Dad said, 'Vanya, you're going to Milan for the Champions League final,' I exclaimed, 'Is it for real? Is it really me? Isn’t it a mistake?'" Twelve-year-old Vanya Yerofeyev from St. Petersburg still cannot believe that he found himself at the epicenter of European football life for three days in late May as the winner of a competition for young journalists, a social initiative organized by the Russian gas giant Gazprom. In late May 2016, Yerofeyev went to Milan with his 31 foreign colleagues to cover the events of the Football for Friendship international children's social tournament. The young journalists had the opportunity to work side by side with their older counterparts at the international press center, interview the young players and soccer stars. In Milan, Yerofeyev finds time for everything: A few minutes ago, he watched the display with the results of matches and now he is encouraging players from the Zenit children's team from his native St. Petersburg and having a chat with a young journalist from Japan. "I did not even think that it would be so cool, great, warm here, that we all would be friends," says Yerofeyev, whose dream is to become a sports commentator on television. "We talk about football, about expectations from life, about everything." Some of the media's attention at the event was drawn to young Syrian players from the Al-Wahda club (Damascus). "My father has a dream – to see the Champions League final [at least] on TV, but he cannot fulfill it – there is no light in our house," the Syrian team's captain Hamzeh Alsabbagh told RBTH. "During the match, he will be picturing me sitting in the stands of the San Siro." 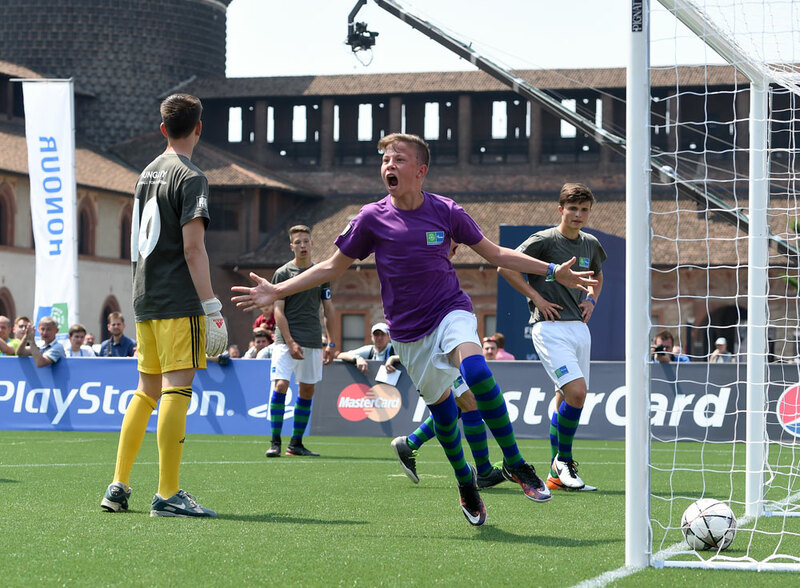 In the final match of the Football for Friendship tournament, which took place near the famous Castello Sforzesco, the Slovenian national team, represented by the players of FC Maribor, beat the Hungarian team, comprised of young masters from FC Debrecen. The UEFA ambassador, 1990s Real Madrid star Míchel Salgado and the Football for Friendship program's global ambassador, legendary German footballer Franz Beckenbauer, came to congratulate the winners and greet the participants. "It is an excellent platform for the emergence of stars," said Beckenbauer, who expressed confidence that new talent may emerge thanks to Football for Friendship. "I myself started playing football in the streets, it was after the war, and, of course, I did not see such good fields, such organization at that time," he said. Ahead of the final match, the young footballers voted for the club, which, in their opinion, promotes children's football on the planet most of all. The award – the Nine Values Cup – went to FC Bayern Munich for its initiatives to support children with disabilities and child care programs throughout the world. The Football for Friendship international children's social project has been held by Gazprom since 2013. With its help, the company wants to develop children's football, to encourage tolerance and respect for different cultures. The Football for Friendship's International Children's Forum (the main event of the project) gathers players aged 12 to 14 years from the world’s leading football clubs. The tournament is held annually ahead of the UEFA Champions League final.